Morne a L'Eau's annual Friendship Football Tournament was the scene this past week where 12 Under 17 Footballing Teams battled for the FRIENDSHIP TROPHY. Dominica's Team hailing from the southeast (from Kalinago to La Plaine), fought their way into the FINAL and were narrowly nipped into 2 nd losing in a close match 1to 0. Etoille, many times Champion, barely emerged once again, but not without many exciting attacks from "Equip de Ia Dominique". The tournament took place on 28th to 31st March 2018. This was the best showing of a team which had competed in this annual event for four years. Showing flashes of quality football that evoked stadium announcements of "Gade Vitesse", "Randell,Randell" the team earned the respect and admiration of the crowd thrilled by the aggressive, attacking play. Enroute to the final the team had to get past top Guadeloupian clubs CSM, Phare and MCJ, to the surprise of the local crowd, all the while building their confidence to face perennial champ Etoille. Star forward Randell Coipel had many Etoille fans on the edge of their seats with his speed constantly threatening and nearly netting goal five times in the tense final. 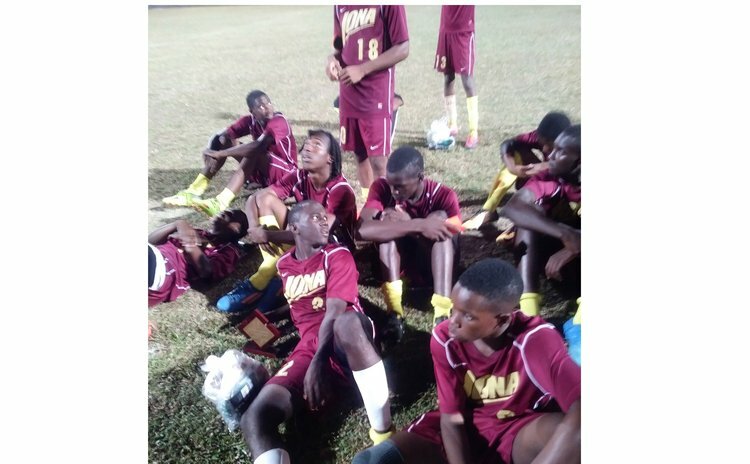 Overall the Southeast midfield led by Coann Lockhart and Shermanie Graham and defense marshaled by Felix Prosper, Trevaughn Prosper and Ijani De Jean were solid as the eventual winner launched forays that were foiled but not without drama. With Dhante Challenger at goal, and wingmen Neilbert Thomas and Troy Lewis always ready to charge down the line the team earned the applause and appreciation from the partisan crowd. The Southeast team arrived home happy with their 2nd place trophy and individual prizes on Easter Sunday after five days of being guests of the Marne a L'Eau mayor's office who organizes the event. Sponsors that thankfully supported cost of travel and other expenses and made the tour possible include, the players' parents, Dominica Football Association, Prime Minister Skerrit, Express des Iles and Dominica Olympic Committee. Coordination, training, selection, coaching and management provided by the South East Football Club. Len Johnrose: "I'm not afraid of dying"